Have you met at least once a turtles in Minecraft PE 1.5? If yes then now it can not only swim next to you but also become a very useful friend. The fact is that the Tameable Turtles addon modifies the behavior of turtles thereby making them tameable. This means that these reptiles will help you like horses or wolves or any other tamed animal. How to tame the turtles? Take a new plant that is kelp. Turtles adore it and are easy to tame if fed by this marine plant. Tamed turtle will no longer leave you and will follow until it dies. 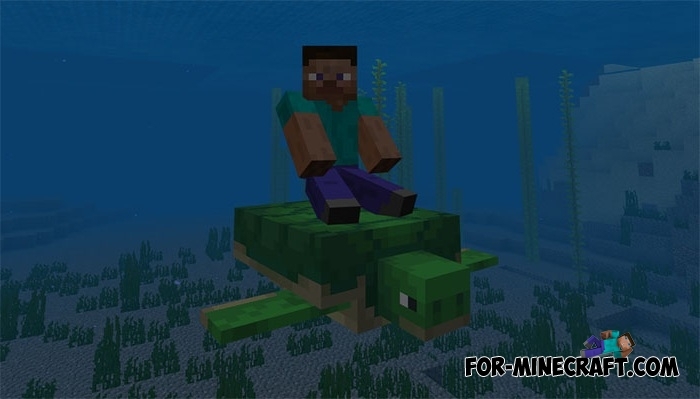 How to ride tamed turtles? Approach your unusual pet and click the Ride button. After that you will be on the turtle shell and can swim (if you are in the water) or crawl overland. Thanks to a solid shell, your tortoise will live long enough if you do not interfere in fights or fall from the mountains down. How to install the Tameable Turtles addon?